It is finally time for the 5th Annual Christmas Love Campaign with Susan K Weckesser Inc. This is such a special cause and I hope you will take part with us this year. 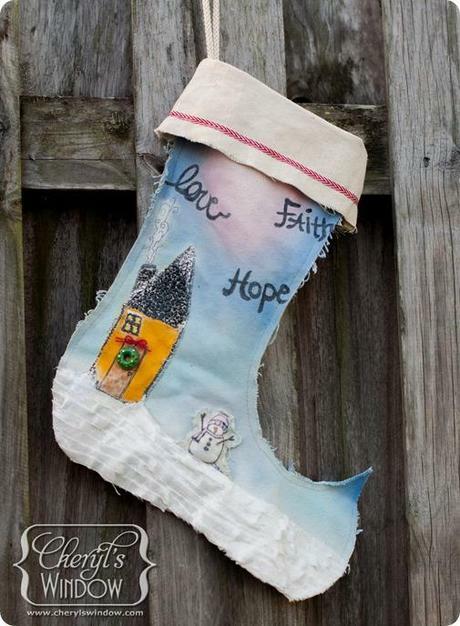 I used products by Susan K Weckesser & Unity, Canvas Corp, Tattered Angels, & May Arts Ribbon for my project and created a hand-painted Christmas stocking. Canvas Corp has a few different stockings in raw canvas and burlap as well as many other products made from canvas, burlap, papers, etc. You can see other samples of my work with Canvas Corp at Canvas Corp Everyday Gal Tote, Window Box Frame, and Espresso, Café Latte, or Macchiato. I love the natural look of canvas and burlap for Christmas decorations. I decided to paint my stocking with PanPastel. Before coloring the stocking, I stamped the main images I wanted to use on masking paper and cut the images out to protect the surface I did not want colored. 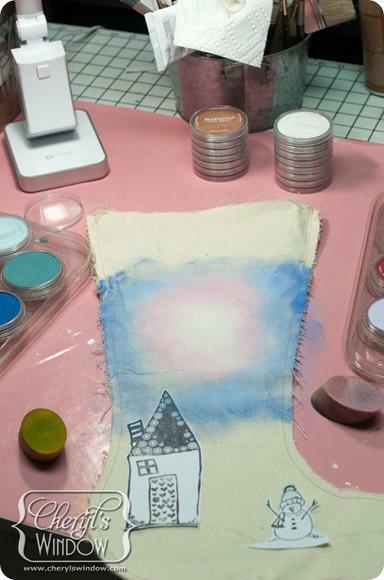 After applying the making paper (it has a repositionable backing) to my stocking, I colored the stocking with PanPastel colors blending them to create a nice soft background. Using the Sofft sponges, I was able to continue applying color, pouncing it into the raw canvas and blending. The PanPastel was sealed using Helmar Matte varnish Krystal Kote. 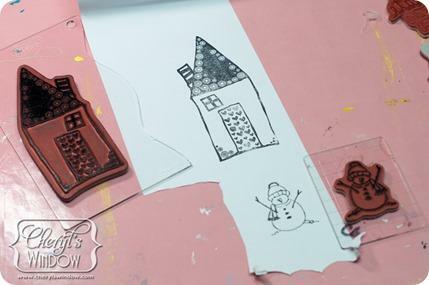 I then stamped the house with the house image from Heartfelt Warmth and embossed with Ultra-High Ebony WOW embossing powder and then colored the house using more PanPastel and a little white acrylic paint for extra snow! I used some sentiments from Painted Sentiments and stamped them using bone black acrylic paint. Perfect stamp set for this, huh? 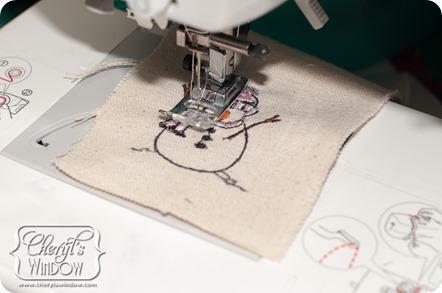 This adorable snowman stamp is a very special stamp we use during the Christmas Love Campaign. Isn’t he so cute? Each purchase of this stamp will donate $3 toward the Christmas Love Campaign. Here is a direct link so you can buy your One of a Kind Winter at Unity Stamp Co. Instead of stamping the snowman directly on the stocking, I changed my mind (go figure..) and decided to make him 3D. So I stamped him on some Canvas Corp raw canvas and stitched his outline in black and then came back with basic zig-zag stitches and colored thread for his arms, nose, hat, and scarf. 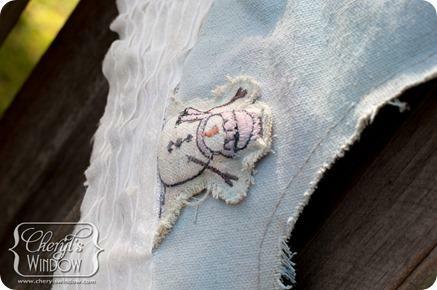 I doubled some canvas and roughly stitched around him to create his basic shape and then stuffed him. I’ve been having fun with my sewing machine out lately, though my family might want me to take it off the dining table. My little 3D puffy snowman was then glued to the stocking. I decided I wanted more sparkly snow, so I glued layers of May Arts ribbon in sparkly white as a snow base. I love all the different ribbons offered by May Arts. They are some of the best! 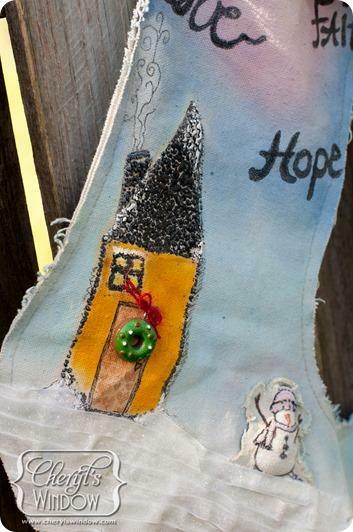 I also sewed another strip of May Arts ribbon around the cuff of the stocking. The stamped and colored house was finished off with a little wreath charm from my Prima Bead ‘Tis the Season’ collection and the stocking received a final mist of Chalkboard Mist by Tattered Angels for an extra hint of shimmer. I wish you could see it in person. 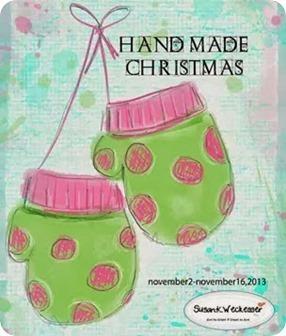 I hope you are inspired to create your own Hand-Made Christmas this year. To further encourage you, how about entering your Hand-Made Christmas project in our Hand-Made Christmas Contest? To start this wonderful year 5th year of the Christmas Love Campaign, we are having a Hand-made Christmas Contest. *Like the Christmas Love Campaign Facebook page —> HERE. *Take a picture and post it on our Facebook page. Or if you have Instagram post it there and tag it #craftuplove , #christmaslovecampaign & #susankweckesserinc so I see it! You can find me @ [SUSANKWECKESSER] on Instagram, so come follow me and I would LOVE to follow you! So much fun! *Give your gift to a neighbor or stranger to make them smile! SPREAD THE LOVE! *Come back to our Hand-Made Christmas post and let us know that you have crafted up some love and you will be entered to win an awesome prize pack from the above sponsors. The prize will include lots of goodies so you can craft up more love! How awesome is that! You have until November 17, 2013 at midnight MST to enter. Have fun!